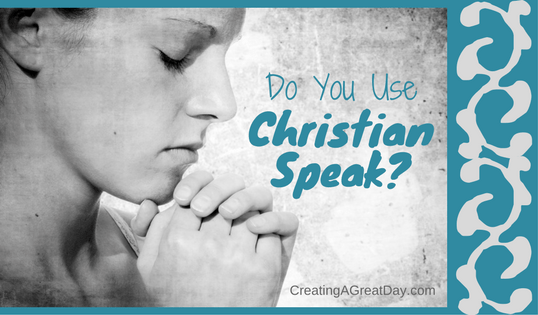 Are you using “Christian speak” out of habit or out of thoughtfulness? What does that phrase mean? Have you listened to what you say? Why did you say that? As Christians, we tend to have our own insider language. I have been thinking about this lately. I post a daily prayer on Facebook and as I typed these prayers out, I started thinking about the words I was using. We pray these words and say “churchy” things, but what exactly do these words mean? Lead, guide, and direct us. We’ve all heard these words said in a prayer. Think about it. They all mean the same thing! Why do we feel like we have to be redundant? 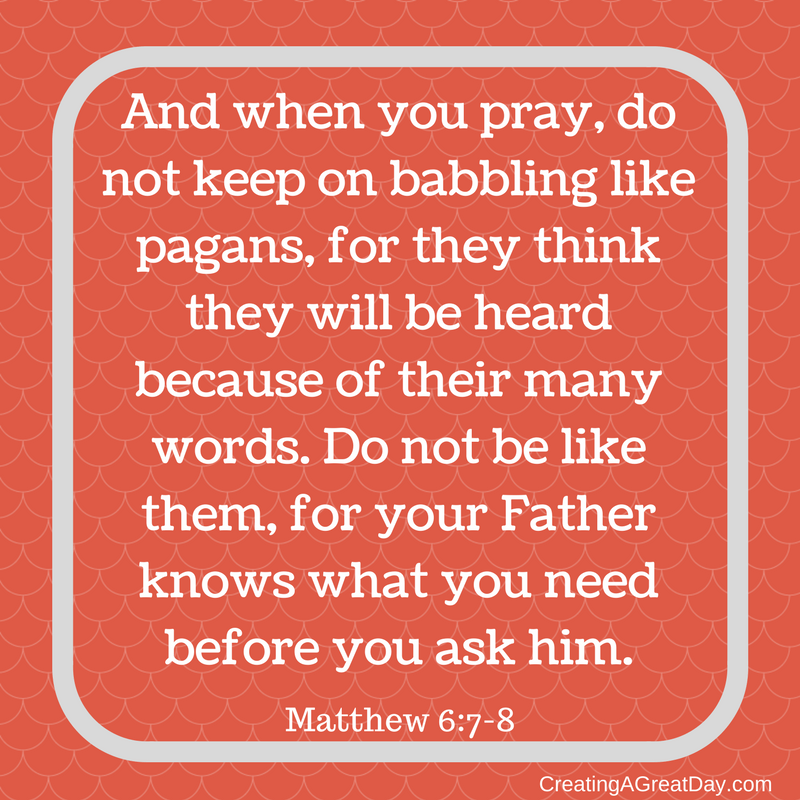 Do we think by using more words in our prayer God will be more likely to listen? I do not believe God works that way. He hears ALL the prayers of His children. “God, help me!” is enough. Or are we just trying to sound good? 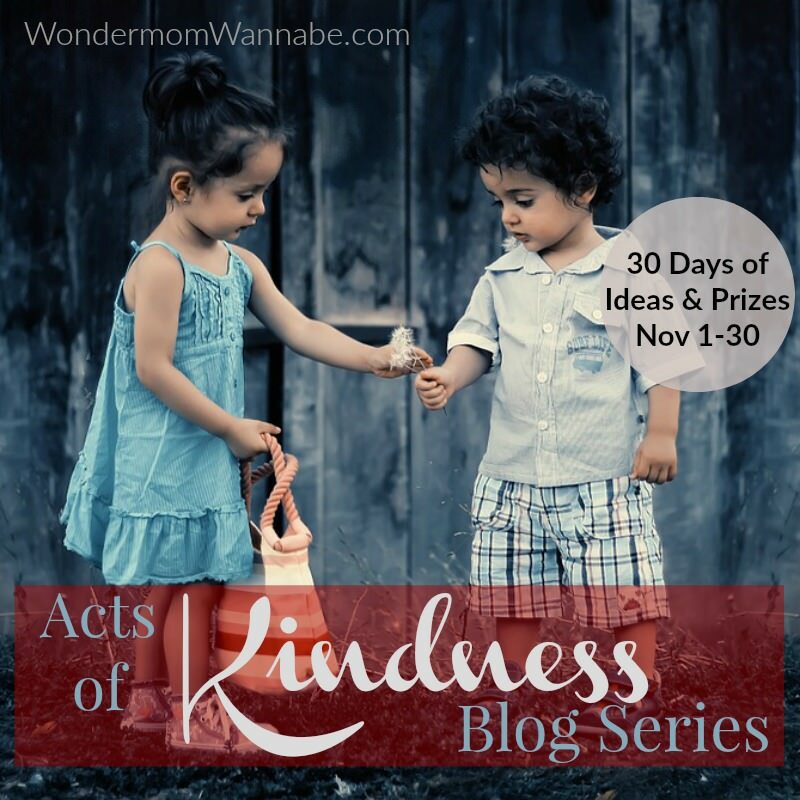 Are we being like the Pharisees and doing things for show? Shouldn’t we keep our prayers simple? Really?! 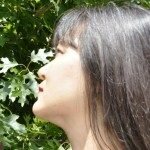 Do we want a “hedge” around us to protect us? Rather, why don’t we say, “Protect them?” That is what we want, right? The Christian comedian Tim Hawkins has a joke about this, and it’s so funny! If you use these phrases in prayer, I do not mean to offend you. 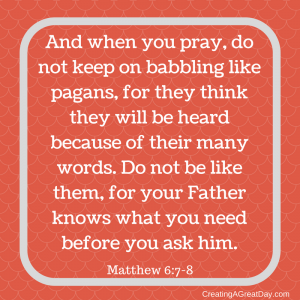 God wants us to pray/talk with him. He doesn’t expect us to pray perfect prayers. Because He loves us, he wants us to communicate with Him. 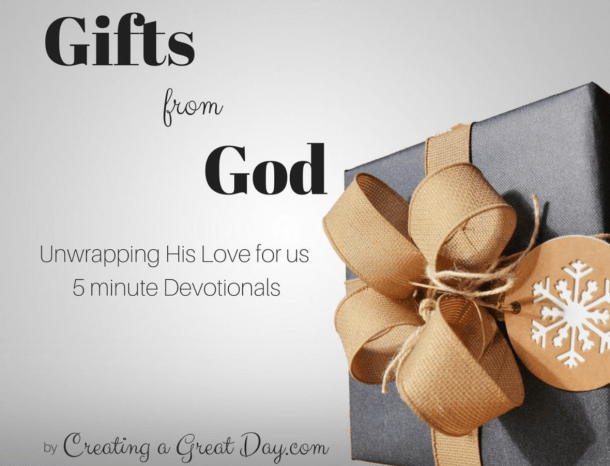 We can release all our emotions to him along with all our words, or we can simply cry out with the minimum amount of words. Our prayers do not have to be flowery or complicated. Just talk to Him! However, I think we need to be more aware of what we say or pray. Sometimes, we pray these words because that is what we hear others say. It sounds good so we do not give it much thought. We just repeat what we hear. Let’s encourage each other to put more thought into our prayers and avoid saying things out of habit. What “churchy” phrases have confused you? I do use many Christianese phrases but I know my audience, do to speak. I try not to use them often with unbelievers but slip into it with believers. Right. I think a lot of it is the way we were raised. We imitate what we hear. Exactly, we think we have to say flowery prayers. All we have to do is talk to Him. When you have been around church very long, it’s hard to not start sounding like others. God just wants to hear our heart! Good points! I try to avoid using too many Christian-isms around non-Christian friends, just like I don’t use newspaper jargon around my friends and family who work elsewhere. I still use some of them, too. I am wanting people to be aware and deliberate in their prayer life. Prayer is us having a conversation with God. It should be natural. It’s what we grew up hearing. I pray in many different forms just like my moods come in many forms. I was once told that Jesus had all feelings and it is ok if we do as well. We should always remember that God does all ready know all our past, present and future. I do believe that there are prayers in public that are stretched and enjoy more language than others but perhaps that is how that person was taught to pray. Yes, God knows our hearts. We must be intentional in our prayer life.